Production on RollerCoaster Tycoon World is flying along at breakneck speed. The team is working hard to finish the updated coaster system and all the other bits of fan feedback we received from our previous public test. We want to show you what we’ve been working on, so we have some exciting upcoming streams! Tomorrow - Friday 12/11 at 2PM EDT - we will be on JMR’s Twitch channel for an exclusive RCTW interview! JMR is one of our volunteer forum moderators, and a huge supporter of the game. We want to give him an opportunity to answer his and your burning questions. If you have something you really want answered pop over to THIS THREAD to make sure JMR puts it on his list! On the following Friday 12/18 at 2PM EDT, we’ll be streaming the newest build of RCTW on Alienware's Twitch channel. The game is looking beautiful, and our team has implemented a ton of updates already based off of your feedback and our private tests. 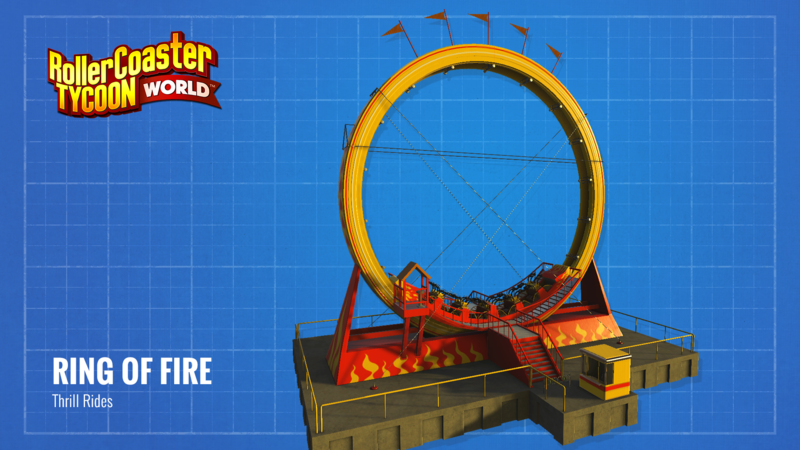 Come and see RollerCoaster Tycoon World played LIVE on the stream! RCTW is now being tested in small private group sessions to ensure we get everything right before our next public test. We’re gathering tons of useful data, and the reception so far has been fantastic. Thus we will be moving the public test to early next year. Lastly, we wanted to highlight a really awesome video we found made by Andrew McMurray (aka AndrewMFilms)! Curious to see what “A Fun Day in Roller Coaster Tycoon!” could be if it were a real life park? See for yourself! Here's the interview with JMR and Mattlab! Last edited by The Stig; 12-12-2015 at 04:44 PM. Great model ! Great flatride. See you tomorrow with JMR. HOLY DONKEYS ! 18 december ACTUAL GAMEPLAAAAAAAAAAAYYYY !! Where is Cartman's cryogenic pod ? Sounds awesome! I'd love to help "private test" if the opportunity ever arises! "Thus we will be moving the public test to early next year." So are we having the 2nd beta plus this public beta or the 2nd beta turned into a public beta and pushed to early 2016? No public beta Second beta is early next year. No date announced yet. Wow! I cant believe we've had 27 blog posts already. The Superloop is turning out good and I'm excited to play around with it in the game. JMR's show should be fantastic tomorrow and I'm hoping to get a couple good questions answered. The stream next Friday will be interesting too. It's a start Mattlab, but one picture of a flat ride sketch and announcing an interview won't win us over THAT much. Your still providing us with as much new information as you did with the last 'announcement'. I'm starting to feel like they aren't even announcements anymore as much as they are re-iterations.